Fake Apple stores are apparently flourishing in China, much the iPhone black market has been flourishing there since 2007. Reuters is reporting that authorities in China’s southwestern city of Kunming have identified another 22 unauthorized Apple retailers weeks after a fake of the company’s store in the city sparked an international storm. The fake Apple stores in China reportedly sell genuine Apple products like the iPhone, iPad, and iPod devices. Employees wear the custom blue t-shirts. And in some cases, as it was reported when the first fake Apple store was revealed, some employees actually believe they work for Apple. 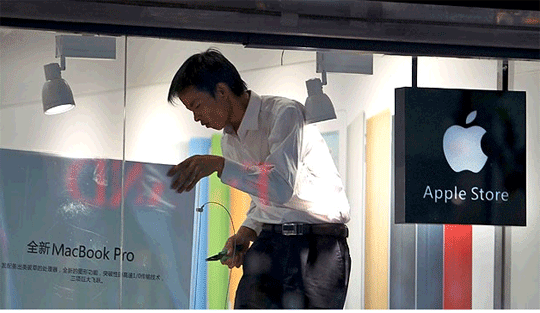 According to Reuters, in July, inspections of around 300 shops in Kunming were carried out after a blog post by an American living in the city exposed a near-flawless fake Apple Store where even the staff were convinced they were working for the California-based iPhone and iPad maker.